The team woke up early as usual and after their morning chores, headed to the park to finish the work started the previous day. The Mec E’s – Jerry, Chris P, Chris O and Kent – installed the hall-effect sensor and Nik hooked up his laptop to begin testing. After some fiddling with the code and the GUI, the go-pedal was pushed. An even louder VROOOOOOOOM! We didn’t know if it was possible, but the motor was going faster than yesterday! Hilariously, the noise was loud enough to scare Alex and Nathan quite a bit. While this was going on, the electrical team was dealing with another issue that had cropped up. The steering wheel screen had suddenly stopped working. This is a major requirement for the competition since the driver needs to have an accurate speed reading when driving. The screen also allowed the operation of the headlights, turn-signals, and hazard lights. Thankfully after a few hours of work, the EE’s were able to get the screen to work. We immediately lined up for our second attempt on the track. In order to qualify for the Drivers’ World Championship, we needed to complete at least two runs around the track. There were only two attempts left – the one we were queuing up for and another the next day. In order to qualify, we needed to finish a run both times. While in line, Mihai, Nik, Reegan, Nathan and Ryan were frantically trying to make one last modification to the motor controller. In our system, the pedal voltage changes depending on how much it is pressed. This voltage can then be used for either RPM or current control for controlling the motor. We were originally doing RPM control but this wasn’t very efficient as Mihai later realized. So we decided to switch to current control…while in line for the race. Incredibly, the EE team pulled a rabbit out of a hat and was able to get the configuration to work on a dime. It was time to race. There were some issues with the fuel-cell system not starting up just before the track but thankfully, those were fixed too. Waiting in line and working on the car! Everybody’s working and thinking hard! The car was brought back to the paddocks but we weren’t the least bit disappointed. We knew that making it this far with a brand new car, winning the Shell Eco-marathon Americas, getting invited to London, and finishing one lap of the much more demanding London track were all significant accomplishments. We posed for one last team picture and then sat down for a much needed break. With one more day left in London, we decided to use it for some sightseeing and general relaxing. Later in the evening, we cleaned up the paddock, packed all our equipment and left for the hotel, satisfied at our progress. It had been a great experience overall. 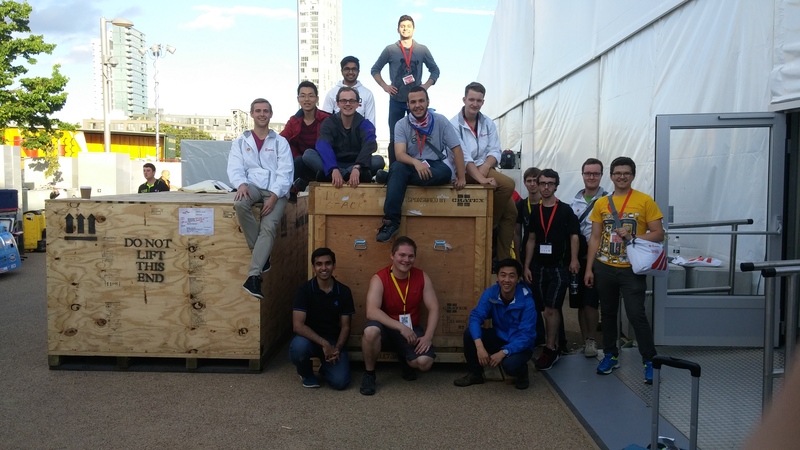 We learned a lot from the European teams who were more experienced than us and from the Shell Eco-marathon Europe itself. We hope to apply these lessons and come back stronger for next year’s competition. And now, it was time to go back home and start working for 2017. Here’s to more success! Car and equipment all packed up. Relieved to be finally done for the year. Next PostNext Come out to our AGM!